Happy Monday everyone! Did you miss me?? I have to say that while i DID enjoy the time off, there was a part of me that felt like i was forgetting something important each Sunday night... it's nice to be back! WOO!! Challenge #53!! Can you believe it? I sure can't. I'm so thrilled to be hosting the second year of these weekly challenges. Sunday my amazing and wonderful husband B-rad had a birthday, so i want to dedicate this challenge to him. He has been so supportive of this blog. From editing my posts for me, to giving the occasional challenge idea...to naming the challenges... he's so understanding when i'm up tangling and typing frantically on Sunday night, and he is my number one biggest fan. He watches the slideshows, he checks my blog hits and keeps me informed of where my counter's at. I knew when i did the tangle that i wanted to name it for the hubby, and threw around beerad, bierahd, or even b-rad - but nothing was right... then i remembered 'undine'.... and i thought it fitting. My Undine love for my husband. :) heart. Oh, and there is a new feature on the Weekly Challenge. The first Monday of the month will feature one of YOUR tangles!! yes! I figured it would be a great way to get some practice on those tangles that i see on your blogs and image hosting sites, but can't seem to find the time to get around to trying them out. If you're interested in submitting a tile to the pool, click here or follow the tab "Use My Tangle" at the top of this page. Yes,as a matter of fact, I did miss you and your challenges and news of the kiddos. Welcome back! Happy Birthday B-rad and happy New Year to you all. It's good to have you back, Laura. Love your post. We all love B-rad, too! What a great start to the new year! So happy challenges are back! Happy New year. Also thank you for Undine. It is a lovely tangle and we thank you Brad for the inspiration. I love your new tangle "undine" as well as the name; Happy birthday to your hubby. In addition to using your new pattern, I have also added a tangle pattern I created as well. Glad you're back - I love your weekly challenges - they always spark my imagination! Welcome back - you were missed. Hope you family had a wonderful, healthy, restful holiday! Can't wait to try Undine! I think of a honey comb when I see your tangle and the love that you have for your own honey of a man. Happy B'lated Birthday to your husband. Sorry to be dense, but I'm not sure what the challenge is this week? Is it to make a tangle using Undine? Thanks for hosting. Discovered Zentangle a few weeks ago and am now hooked! I was way behind on my weekly challenges, then I finally caught up last weekend and did miss you when you announced the next challenge wouldn't be until today. Welcome back! Happy Birthday to a fellow Capricorn! I can't wait to try the tangle, Laura. Undine (or Ondine - pronouned Uhn-deen') is a water nymph of German folklore. A friend of mine from college had a daughter she named Ondine. I always thought it was such a beautiful name. But I like your pronunciation, too! Glad to be back in "challenge" mode. So glad to be a part of this challenge. I can't wait to see all the different Undines! Happy Birthday B-rad! Thanks for being a star support to Our Diva!! Yes, I missed this challenge! 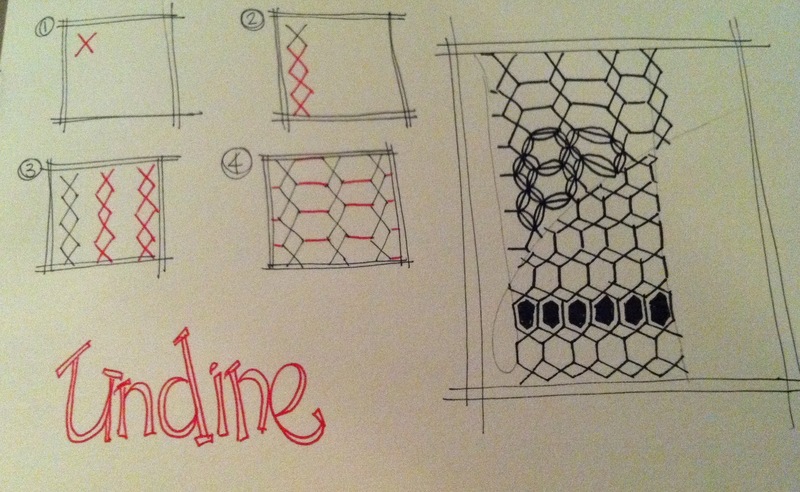 Undine is a great new pattern. It inspired me to a variation in my embroidery yesterday. I added the link in my challenge post. Thanks for inspiring me! Need a little help please. Tried posting my first weekly challenge to your site and don't think I did it correctly. Thanks for Undine. Thanks for inspiring me! Missed you. Glad your back. Glad to be part of the weekly challenge. This was a fun tangle! Lots of possibilities... welcome back and happy new year! So pleased to have you back and in action Laura. Good to be back to the challenges! Thanks. Welcome back, Laura..we missed you! Thanks so much for all that you and B-rad do on these weekly challenges. Hugs to both of you and your sweet kids! Looking forward to the 2012 challenges! Glad to have you back, Laura. I'm glad you took off some time off, though. If anyone deserved time off, it was you. I don't know how you keep up with it all! I just love this pattern, so much possibilities! Hope your battery is filled up again! Welcome back! Did we miss you?!!! What kind of question is that? My Mondays were not the same without the challenge and I'm not even joking! Love the new tangle and can't wait for the next year of challenges. Welcome back Laura. I LOVE Undine and the many possibilities it offers! I am #35 for real, and #34 as a flubbed-up entry. Don't know why my copy & pasted web address got messed up, but it did, so disregard #34 please! I'm sorry! I am a newbie to your site, and to tangles and wanted to show you my 5 x 7 thank you card to my daughter for some Christmas gifts. I incorporated her gift and used various tangles to decorate the gift and the spaces around the main subject of socks. Happy Birthday B-Rad! Thanks for such a great pattern! I can't wait to explore this one. it`s my first time with you all in this challenge. I saw a lot of wonderful artwork and started doodling by myself. Welcome back! Hope all is well on the homefront and the kids are doing okay. Thank you for the challenge to bring me back with my creativity! Happy birthday to B-rad! You are so lucky to have wonderful husband as I have my beloved husband that I am so lucky to married my husband last June. May 2012 bring more good and wonderful challenges for everyone. Hello, I am a newbie to Zentangle, but am happy to participate in this challenge. I think I finally linked to the correct challenge number! I'ts great that you're back. Miss the challenge and how are you're kids? Entered my second entry as #51...worked on a different surface for this one. I've been loving all the ways Undine is being used! Sooo inspiring! Welcome back! Birdie and I have missed you. I'll be the first to admit that while I love your tangle, I'm not very fond of my rendition. I will have to play around with it some more. Thanks for another great challenge. Oh yes, indeed. I did miss you. I'm so glad that the new year is here along with you and your zentangle challenges. Here's hoping for a quiet, HEALTHY, fun-filled year! Thanks so much for being you. You are truly awesome. Looking forward to the coming new year of challenges. So glad I found this blog last October & started drawing these tangle patterns. They make me happy! I love undine - it's great to be back participating in the Diva's Challenge! Thanks Laura!!! Better Late than never they say. I have been participating in the Diva Challenge for the last several challanges but had no way to post them. With that problem now solved I am happy to start sharing my results with others.